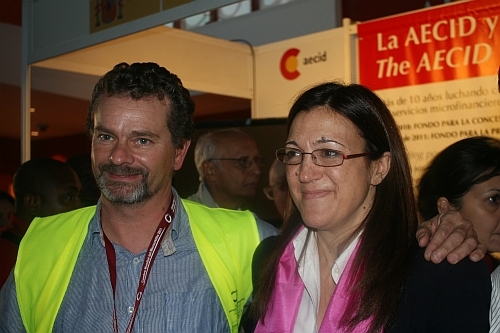 VALLADOLID, Spain, Nov 18 2011 (IPS) - Jesús Guerra, a volunteer at this week’s Fifth Global Microcredit Summit in this Spanish town, was nonplussed by the expensive gold watch sported by a banker from a developing country. Another volunteer, Susana Balet, was impressed by the dedication of some people working in microcredit. She indicated to IPS a presentation made by Ingrid Munro where the focus stayed on the reality of poverty and the importance of alleviating it. Munro, who founded in 1999 the Jamii Bora Group, a Nairobi-based microfinance organisation, firmly believes that any family, no matter how hopelessly poor, is capable of emerging out of poverty. “Human development does not work without people listening to each other, especially those at the bottom of the pyramid,” said Pilar Vereda, in-charge of Institutional Relations of the Fundación Iberomericana de Desarrollo (the Iberoamerican Foundation of Development). But such a dialogue between the providers and recipients of microcredit was missing even at the Nov. 14-17 Summit with the poor figuring largely in presentations and videos. “The people at the bottom of the pyramid have not had their own voice at this Summit although the Spanish platform of non-government organisations had proposed better participation by cooperatives or other beneficiaries of microfinance,” Vereda said. “Finally, their voices were represented through the videos that we produced and broadcast at the Summit,” she said. Muhammad Yunus, founder of Bangladesh’s Grameen Bank, told IPS that a small group of borrowers is participating in the Summit and has even managed to participate in different events. “At this big Summit there was only a small group of borrowers because we want to be sure that they are comfortable and for them to avoid this big crowd of people from around the world,” Yunus explained. “But at the annual regional summits there are usually meetings between borrowers and other participants,” he added. “We have to believe in the potential of people. To be confident that each person knows what microcredit is about. Each person is as capable as anybody in the world because creativity exists in all of us,” Yunus claimed when he inaugurated the Summit. The truth is that the main goal of the participating experts and institutions was how to get more clients and make more money, and this does not always coincide with the idea of making microfinance a tool to fight poverty. For example, U-IMCEC, a Senegal-based cooperative represented at the Summit, aims to contribute to improving incomes and the well-being of families and micro entrepreneurs. Working with 72,000 members, U-IMCEC works by providing access to financial services and creating income-generating activities, especially for the women, poor and vulnerable. “My institution works in the rural areas surrounding the cities, where the neediest live. We have improved their lives with programmes which allow people to receive remittances from abroad without moving to big cities, where the financial institutions are,” Diao El Hadji Moussa, U-IMCEC deputy director, told IPS. “It also has a positive effect on the family and micro business because they reduce costs,” he told IPS. Last year, banks showed great interest in the potential of microcredit, as indicated by numerous Summit participants. “When corporate banks begin to work in microfinance they have to learn and specialise,” said Alejandro Soriano, senior executive at Banco de Desarrollo de América Latina (CAF). “They need to understand that this (specialisation) is essential to guarantee sustainability and that microfinance has a high social impact,” Soriano told IPS. “There are too many examples of banks working with inadequate methodology. When they stop being profitable they drop countries and communities and this causes huge damage to the borrowers, because they do not have any more access to credit,” Soriano added. CAF is a development bank that promotes a model of sustainable development through credit operations, grants and technical support and offers financial structuring to public and private sector projects in Latin America. “Sometimes big banks learn from developing countries’ experiences,” said Estela Cañas, researcher at the Central American University. “This was the case of the Santander bank in El Salvador which invested half a million dollars to learn and spread this knowledge. It was a positive practice,” Cañas told IPS. At the Summit, there were innovative organisations dedicated to development through self-sustainability: connecting socially responsible individuals with people from emerging countries in need of microcredit. Angel Aranda, managing director of Amifi, told IPS how peer-to-peer lending works. “Individuals can make social investments from 20 dollars. By partnering with microfinance institutions we establish the connections with the borrowers in emerging countries. Despite such good practices on the one hand and the problems faced by microfinance institutions on the other, the Summit was still about maintaining a system that maximises profits for some.